Two must-do food events are coming up, folks, so loosen up those belts. These are New Year’s resolution breakers for sure. This Saturday is the inaugural LA Street Food Fest which will feature the hottest thing on the food scene since cupcakes: food trucks! 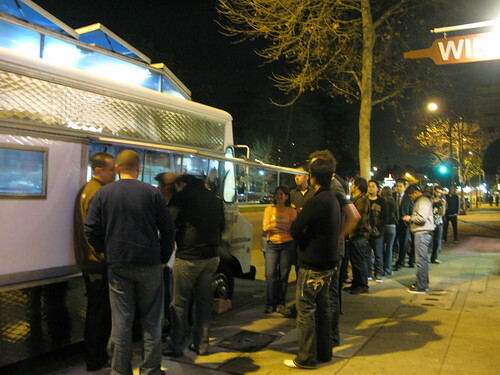 Over 35 of LA’s most popular food trucks and street carts will be available in one spot at the same time, making it really easy to try a whole bunch of different cuisines in one sitting, er, standing. Each food truck will be offering up their special sampling menus at prices ranging from $1 to $5 (cash only). And look for foodie fave, Chef Ludo at his own pop-up truck serving up his famous boneless fried chicken. Mmm! There will also be a beer and cocktails cash bar whose proceeds will benefit the LA Regional Foodbank. General admission is $5 (in addition to the food you purchase at the trucks) but you get a drink ticket as well as the chance at cool giveaways. Last year's packed Gold Standard event. Jonathan Gold’s 2nd Annual Gold Standard event is another much-anticipated foodie fest. Last year’s was a huge success. 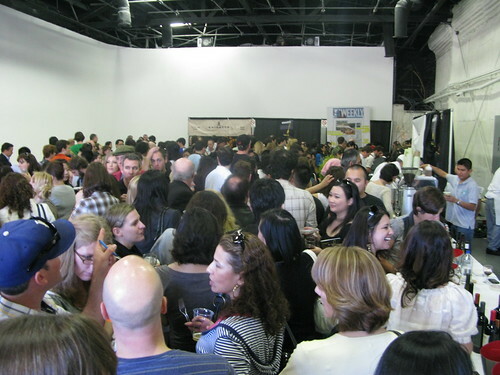 Too successful, as crowds tried to squish their way to each of J Gold’s personal picks for the top restaurants in L.A. This year’s event will showcase about 40 of the LA Weekly‘s Pulitzer Prize-winning food critic’s picks, but this time in the larger Petersen Automotive Museum Pavilion. Thank gawd! And booze sponsors include Bulleit Bourbon and Singha Beer. Noice! Tickets are only available online: They are selling VIP tickets ($80/person) for this event which entitles you to early entry as well as a VIP gift bag. General admission tickets are $60 a person. No word yet if Goldstar will be offering discounted tickets like it did last year. Believe me, I’ve been hounding them. Will keep you posted. BTW, a portion of the proceeds will go to Heal the Bay and Make a Wish Foundation. I think the LA Center Studios is at 500 S. Beaudry. I saw that but when I googled LA Center Studios, that’s the address that came up. But thanks for the clarification. I’ll add that to the post. LA Center Studios is huge and it’s their main tower address you’ll find on their site and google, however, that’s not where the event will be. Revelers should head to 500 S Beaudry (@6th) to enter the event. Our free bike valet entry is located on Bixel. I can’t wait for the food truck festival! All the trucks in one place, no chasing them around. I could go for that! I know! I wish I didn’t have to go out of town the same weekend. Bah!